He was born in 1928 in Hong Kong. He was commissioned into the Punjab Regiment, in 1950. 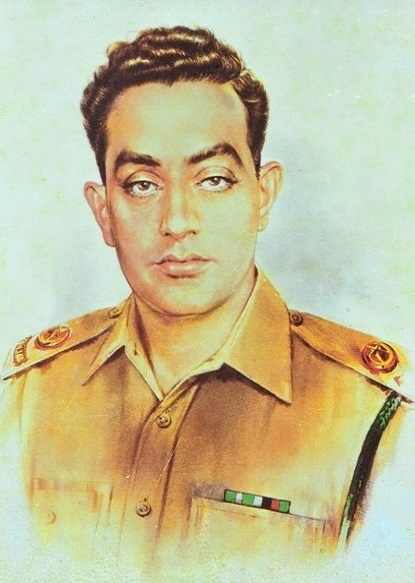 On 6 September 1965, as a Company Commander in the Burki area of the Lahore sector, Major Raja Aziz Bhatti chose to stay with his forward platoon under incessant artillery and tank attacks for five days and nights in the defence of the strategic BRB Canal. Throughout, undaunted by constant fire from enemy small arms, tanks and artillery, he organized the defence of the canal, directing his men to answer the fire until he was hit by an enemy tank shell and embraced martyrdom on 10 September 1965.